There's been so much to write about, and I have so many adventures left on the table that need to be written up - so in between reports on my recent trip to Japan, I thought I'd share some photos from a couple of days on a local stream from late summer. This stream is full of beautiful wild browns, and it isn't that far from the city. I often drive up for a couple hours on the stream when my schedule allows. 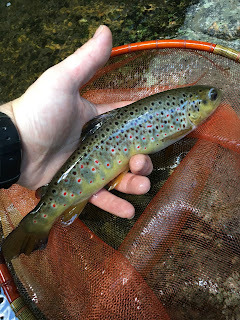 I've christened more than one new Mankyu net on this stream, and I love seeing all the wild browns and their unique colorations in these beautiful nets. The orange-red color of the net bag compliments the brown trout and their red spots so well. I have a couple with this color net bag, and one that is smaller in diameter with a purple color that I mostly use for netting brookies. Unlike most of the wild trout streams in the area, this one tends to hold some larger trout. I didn't get any of those on either of these days represented here, but the numbers were definitely with me. I can often hook into 20 or more fish in a few hours if conditions are right. For this reason, I like coming here to try new flies, new methods, and to practice casting different rods. Its great to know a stream like this... you get to know where the fish like to hold to a scary-accurate degree. There's something really satisfying about knowing when to expect a strike... but there's always a new pocket or a new channel to drift as well. Additionally, on days when the fishing is slow, you don't start to make bad decisions like worrying about "using the wrong fly" or "if maybe there aren't any fish in the river." Then you adjust your technique and start getting right back into the fish again. On one of these days I was fishing the Tenkarabum 36. On the other, the Oni type III. For this stream, its a hard choice. Since it does hold some rather large fish, its nice to use the Tenkarabum 36. But ultimately, the full-flex of the Oni type III coupled with the slightly shorter length yields a better combo for this spot. Plus I did once land a 19 inch wild beast on that rod as well... maybe that was just luck. The Tenkarabum 36 does fine with the smaller fish though, the ultra-fine tip makes the fight almost as much fun, with the added bonus of wrangling the big ones in faster. The forest surrounding this stream has some beautiful features, and it grows a variety of different mushrooms. I'm starting to learn more about identifying new species but there's a lot more to learn before I'm confident in what's what. I also saw an interesting stick bug which wanted badly to get back into the water. I have never seen these things in the water before. Like all the local streams this year, this one was very low towards the end of the summer. Fishing around big rocks like the one below can yield a strike from a fishing hiding in a small pocket underneath. Little wild trout like these represent the lifeblood of the streams. Their abundance indicates the health of this place. How resilient they are, even in the face of drought, high air temps and fishing pressure. I can't wait until the local season opens again next year so that I can return and cast a fly to these trout once more. As I awoke to another misty and overcast morning in the mountains of Japan, the excitement immediately set in... We would be going into the mountains for an overnight Genryu (headwaters) trip to fish for wild trout with our group, lead by Okushi-San! We piled into a couple of cars driven by our hosts, and I jumped in with Kozue Sanbe. You'll get to hear more about her later - she was so helpful and made sure we were completely taken care of during the mountain village part of our trip. She took us up to a closed road... the gate was locked, and only locals had the key. This hopefully would improve our chances of good fishing due to decreased access. She unlocked it and we were on our way. We drove ahead through the gate and into a long, dark tunnel. It really set the mood along with the mist drifting through the mountains, and before we knew it we were at the trailhead. Packs were shouldered and we eagerly began to make our way down the hill towards the water, looking for some sort of trail. We found a footpath and followed it down to the water, where we came upon a beautiful river valley with a small stream running through it. We were a bit disappointed to see how low it was running, but at least this would make the travel easy. The downside? The fishing would be hard. But that's ok, because that's what I expect in Japan. It just seems to be how it is. The colors of the natural world began to distract me from any previously mentioned discomforts, and I ate some beef jerky while walking up the stream. Soon we were into water that we were told to fish, so we fished! Maruyama-San began to take some photos, and we took turns fishing a few prime lies. We each spooked some fish, but I also missed a nice take. Yamano-San was practicing his casting along the stream as we walked. I noticed he was asking questions and learning a lot. The interesting thing about being a rod maker, apparently, is that you don't have a ton of time to go out and fish one particular style, because you have to fish them all, as well as make rods for them all! Think about how difficult that must be, to be expected to master many different styles of fishing instead of just one, while working on the rods themselves? Impressive. Okushi-San landed a nice fish as we looked on. After a little while we arrived at a good spot to set up camp, or Tenba as it is called in Japanese. Quickly some tarps were strung up, I set up my Zpacks Solplex, and we stashed all the gear and food before heading back out to fish for the rest of the day. Rain was forecast for the evening and into the next few days, so we were hoping it would hold up while we fished at the least. For the most part, that's how it played out, but we didn't get any sun. That probably improved our prospects. Below, Ito-San crouched behind the spine of a rock, staying hidden, trying to coax a strike from an Iwana without spooking it - a tough spot to be in! We worked our way through a mix of different kinds of pools and runs, and they were all challenging and fun in different ways. Ishii-San fishes a Daiwa Rinfu, which is a Hae rod. Hae rods are different than Keiryu rods in that they are designed more similarly to Tenkara rods, and are designed for catching small mountain chubb on a fly. I have one of his older rods and I really enjoy using it as well. Its very long for a small stream like this, at 4.5 meters. The other guys were between 3.6 and 4 meters mostly on their rods, and I was likely the shortest with my Oni type III, at 3.4 meters. The longer rod is a big advantage for stealth. After a few fish were caught, we stumbled upon one of the highlights of the trip for me... rock-pee! There are places where the water comes right out of the cliff, having taken many years, and in some cases decades, to filter through and leak out from the cracks in the rock beneath. This water tasted so good it made me want to do a little dance. I gleefully filmed it, photographed it, and then laughed about the name that Ishii-San had explained to me. Rock-pee is the name for just this particular kind of spring. It was extremely mineral-laden, cold, and refreshing. It felt like I had found the fountain of youth. Obviously I drank as much as I could and then filled up my water bottle as well. Just upriver from "rock-pee run" was another nice set of cascading pools. You can see how the walls of the little canyon squeeze the stream and concentrate the water here. Notice how everyone is in line and waiting their turn? Respect. There is no walking up river around a few pools to fish the next section while your buddy fishes the lower section. You'd scare all the fish on your walk up. So everyone takes their turn. And it is extremely effective. Again, we were given an unfair amount of time ahead of the group, for which I am extremely grateful. Other people sacrificed their fishing time for us, so I tried not to waste the opportunities I was given. I did lose a few fish while everyone was watching, which frustrated me just a little bit. But of course I landed some fish, too. The surroundings were somewhat surreal, and the company was great. We were having a great time together, and that's what this is all about. As we walked, I found many unique flowers and did my best to photograph them in the flat overcast light. Soon we arrived at a waterfall, or an "Uodome" which means "fish stop waterfall." Everyone stopped for lunch, but Adam-San and I wanted to fish the waterfall. He took the left side and I took the right. He fished first, getting a few casts in. I moved around to the right side and stood far back on the shore, casting up to the waterfall. I soon hooked into a nice sized Iwana, and the fight was on! It was a good fight, and this fish was big enough to keep... we wanted to take 2 for stream-side sashimi later on. This group is very much about catch and release, as am I, but its also important to me to keep a few to eat here and there. Besides, stream-side sashimi is insanely good, and is a bit of a tradition in these situations. I was ecstatic. I thanked the fish for being there for us, and then joined the group to boil some water for ramen. The rain was holding off and after lunch we climbed the waterfall one at a time. This wasn't that difficult of a climb at all, but someone rigged up a balance rope just in case. We continued to work our way up the river and found many more cascading pools. Ishii-San has very good form when casting, and he can reach far up stream. This is an effective method and demonstrates a great stance for Tenkara casting. In Japan you coax a fish to your fly with manipulation. A dead drift on a short tippet won't bring as much attention. Slightly longer tippet allows the fly to sink deeper before you manipulate it, and to drift more realistically between twitches. There were fish hidden under many rocks, and they were extremely hard to see from far away. Even though the water was crystal clear, it wasn't easy to see them at all. This clear water also means that the fish can see you from far away, and so you have to stay low, mostly out of the water if its this low, and use rocks as cover to hide behind when you can. But for this trip it was no concern. Below, Ishii-San and Adam-San fish another dual waterfall pool. We didn't get any fish in this area, and I wondered if somehow they were spooked. It looked like prime water. Ito-San offered me a few of his flies while we were talking, and so we made a trade. He warned me "not my fault if you don't catch any fish with them..." I laughed. Around this point Adam-San and Ishii-San took a break and we sped up ahead. I caught one more fish, and lost another, and then Kura-San got a few. We took turns on a few pools until we suddenly heard voices. That was a surprise because there wasn't another easy way to get to where we were, and nobody had passed us or come in from the closed road where we had come from. It turned out to be a couple of friends out for a weekend fishing trip. But how did they get here? Some of the guys stopped and talked to them, and it turned out they had hiked in almost 6 hours on an ancient overgrown trail to reach the upper reaches of this stream, and it intersected where we had run into them. They had set up camp and caught a few already, and were fishing when we arrived in a small pool. They told us we could go ahead of them for a little bit, and then they'd walk up ahead and fish above us after. That was shocking to me... these guys had just come almost 6 hours on a grueling hike and they wanted to let us fish their water up stream from their camp before they got to fish it? Now that's respect. Are you seeing a pattern here? Its just too bad things are not like that here. We fished up a little farther, walking with the two guys as they chatted in Japanese with Maruyama-San and Okushi-San. I caught another fish, as well as losing a second. Kura-San and Maruyama-San went ahead with the other two new guys we had met, and the rest of us turned around as it began to drizzle. We started moving quickly down the stream to meet back up with the other guys. At some point it started to rain harder and I put the camera away and focused on my footing. Our group made quick time back to camp and we were soon under tarps as it began to pour. The rain let up a bit after about 15 minutes of beer drinking time, and the guys started to make camp. We gathered all the food and began to organize ourselves and divide up tasks. A few of the guys started a fire, the hangos for cooking rice were filled with rice and water, and a support was set up to keep them suspended above the hot flames. Maruyama-San was a master at making Tenba. He was fast and efficient at pretty much everything. He showed me how to properly filet the trout for stream-side Sashimi, removing the skin with his teeth in a traditional way. It was quite a show, which I got a nice video of. Its too long to upload here so I'll put it up on vimeo later on. And here's the result... The sweetest, most delicious sashimi I have possibly ever had. Trout tastes really good this way. Its too bad this wouldn't be safe back home in the few places it could be allowed to take clean wild fish. There are no parasites in the fish in these rivers, no beavers or Giardia to fear, and no herds of animals where we were to infect the waters in any way. Ishii-San prepared some Japanese cucumbers while the rice cooked. The fish carcasses were smoked for later on. Ito-San brought a huge stew pot, potatoes, konnyaku and some delicious frozen beef pieces to make a local stew from his area. Below, he cuts some gobo root, which is a local wild edible plant into the stew. Maruyama-San used a stick to feel the vibrations of the boiling water. This is a simple and brilliant idea, since one cannot open the top of the pot to check on the rice for multiple reasons. Once the vibration stops, you know the water is boiled up, at which point the Hango can be removed from the heat and left to steam until finished. Soon it was dark, and the food was ready. We were hungry. Beers and sake began to flow. Yes, we carried all of that up in our packs. This was no ultralight adventure. I straight up felt guilty about the idea of being ultralight in this situation. Sure, they use ultralight sleeping gear and tarps, but that was all to leave more room for the items that mattered most... food, sake, beer! Okushi-San prepared some green peppers, sukiyaki beef, and liver to start. We ate that with Japanese cucumber, pickles, and a few other random items. It was the start of another great night. The rain started to fall harder, but we just drank and laughed louder and tried not to think about it too much. Ito-San's stew helped quite a bit with that... and soon we were talking again about Tenkara, about the day, about the fishing, and so much more. Okushi-San told us that the fishing here really wasn't all that amazing compared to the last trips he had taken here, and that it was likely the time of year and the low water. Honestly we didn't much care since we had all caught fish and spent a great day in a new place. If it isn't clear by now, between this story and that from my trip last year, fishing in Japan isn't just about catching fish. For me it usually isn't about just fishing back home either, but we don't always do it up like this. The company was fantastic. The food was fantastic. Everyone was having a blast. Other than the rain, this was perfect. The next day we awoke to a rather swollen river. We packed up and prepared to head out, when the other guys from the day before came walking down the river. They had bailed at "sunrise" because of conditions, and it sounded as though they feared their path back was too dangerous in the bad weather, or possibly that it would take too long compared to the option of trying to hitch a ride out with us. So they joined our group and we began to walk out together. We mostly had plenty of river bank to walk on, but we did have two deep crossings in fast-flowing water. Everyone helped each other out and nobody went for a swim. However, when we got back to where we wanted to hike out from, our path was blocked by nonexistent banks and a raging section of rapids. We had no choice but to scale a steep and eroding riverbank, and the climb was extraordinarily challenging. I described this climb in more detail in my podcast with Tenkara USA, but needless to say, it was a harrowing climb. Luckily we all made it in one piece, and we arrived at our pick up spot early and heated up the leftover stew to warm us up. Unfortunately it was raining too hard to get good photos of this last part of the hike out, but I don't think I'll ever forget what it looked like in my mind. Raging, cold, chocolate-milk water, steep embankments and decaying, frayed bits of rope were our parting gifts from the mountain. Soon we were piling into Sebata-San's van and he was zipping along backcountry roads, driving us to our final destination in the mountains for this trip... Tadami Bansho! Tadami Bansho is a 250-ish year-old Samurai tollhouse that is a Japanese historical landmark, and a special kind of inn for a very select few old-timer fishermen and their friends. We were extremely lucky to have been invited here, as not many people get to stay here at all. Most just get to tour it. Its still a mystery how one makes a reservation here or gets a spot on the tatami mats. Speaking of which... I'll share that tour of Tadami Bansho and the rest of the adventure in Part 4. Stay tuned again!